make some truly kick arse lemonade! We are back to photography, the Photo of the Day (because it is still September!) and this is today’s offering. 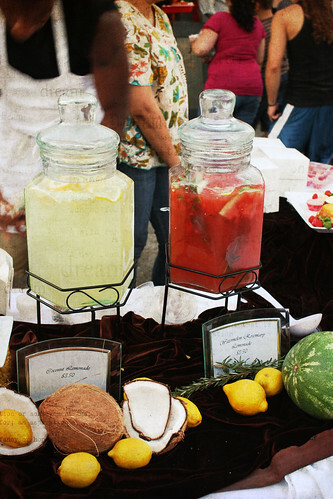 Gourmet lemonades at the Fancy Food Truck Fest that they hold at the Pasadena Chef’s Center every Friday from 6 – 9 pm. I believe one was coconut lemonade and the other was watermelon rosemary. I tried the latter, it was really good. The watermelon mellowed out the lemon, and the rosemary was very subtle. Delicious and refreshing. The Captain, Captain Jr., and Youngest Daughter and I all went out to this shindig last night and pretty much unanimously voted for the Komodo Truck, then Coolhaus for ice cream. It was amazing. I’m really digging the food truck phemonenon that is taking over LA, though I really wish they’d make like Portland and start having pods. Maybe that is next. My little family + food trucks = bliss, in any case. This entry was posted in photography and tagged photoshop, September photo a day. Bookmark the permalink. Oh yummy! I think I would love that second one too.